Every year, the Marching Virginians come together for one last hurrah: Bandquet, an end-of-the-season banquet to commemorate everything that went into making the previous marching season special. This year, Bandquet was held on February 9th at the Custom Catering Center in Blacksburg. Members of the Marching Virginians annually look forward to Bandquet as an opportunity to reminisce about the highs and lows of the season, catch up with friends while dressed to the nines, and to celebrate the organization that every single member has devoted so much time and energy towards making special. The night begins with a social hour, followed by dinner, then “The Season in Review,” and finally awards presentations. Let’s walk through the evening and understand why Bandquet means so much to everyone involved. The night kicked off with a social hour, where members had the chance to catch up with friends and get settled. One of the greatest things about being a Marching Virginian is knowing that you get to spend 5:30-7:00pm every single day surrounded by your closest friends. However, when the season is over the opportunity to be surrounded by your entire section every day is over too. One of the greatest things about social hour is the rush of excitement the radiates throughout the room as groups of friends are brought back together. It would be a gross injustice to not discuss how valued Bandquet dinner is to those in attendance. After all, we are college students, right? We live for food, and the meal provided by Custom Catering is always delicious! The most notable food-related moment of this year’s Bandquet was the mad dash to grab desserts the instant that they were brought out! The Season in Review is my personal favorite part of Bandquet. During this time, we take a look at all of the things that made the past season unique and special. Mackenzie Knox, our Executive Officer, kicked things into gear with a welcome speech and the introduction of guests in attendance. Following the welcome speech, opening remarks were shared by Chad Reep, Assistant Director, and Dr. Polly Middleton, Director of the Marching Virginians. Chad Reep discussed the difficultly of change, and encouraged each of us to assess how we respond to change. Dr. Polly Middleton discussed “First Years,” specifically, her first year serving as the Director of the Marching Virginians compared to her first year at Virginia Tech several years ago, and her first years at other universities. -The welcoming of a new director to the Marching Virginians for the first time in 33 years. 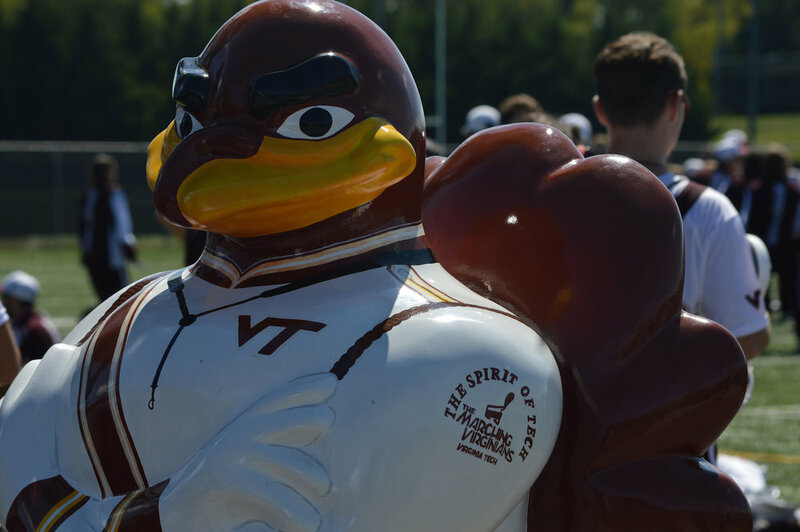 -The first in-band Hokies for the Hungry competition that collected 2,743 non-perishable food donations for the Montgomery County Christmas store. This was followed by an incredible turnout for the Hokies for the Hungry event run by the Marching Virginians. “A Season in Review” was concluded with a slideshow presentation put together by Bob White, the MV Photographer. The slideshow captured some of the most notable moments of the year through his photos, spanning all the way from band camp to the military bowl. As the pictures flashed of individuals that came together to create one sound, one organization, and one family, we were all reminded of what truly makes the Marching Virginians special - the people. The final event of the night is the awards presentation. This time is used to honor MVs for various reasons. This time allows us to reflect on the accomplishments of our friends and teammates and of our organization as a whole. The first presentation during this time is Four-Year Mugs. Presented by Lauren Beard, our Personnel Officer, Four-Year Mugs are distributed to every senior in the band that has been marching since his/her freshman year. The distribution of these mugs really demonstrates the dedication and passion that members have for marching (a complete list of Four-Year Mug recipients can be found at the bottom of this article). Following that, Outstanding Rank Member awards are given out. These awards are selected and presented by rank captains to highlight the member of each rank that went above and beyond during the season. While every member of the MVs shows incredible dedication throughout the season, these awards are a fantastic way to highlight those that really go the extra mile (a complete list of Outstanding Rank Member recipients can be found at the bottom of this article). The Outstanding Spirit award, given to someone who exemplifies the spirit of a Marching Virginian was awarded to Ashlyn McDonald for the second consecutive year. The Ryan Clark “Stackin’ up Service” award was given to Mackenzie Knox for her commitment to serving others both in and outside of the band. The Jackie Bruhn Outstanding Rookie award was given to Julia Pimentel for her dedication to the Marching Virginians and willingness to go above and beyond as a rookie. The Outstanding Band Member award was given to Eric Chang for his excellence not only as a musician and drum major, but for his dedication to the organization and his outstanding character. The Tau Beta Sigma “For Greater Bands” Award was given to Joseph Tolley - Intrumental and Meredith Smith - Visual. These recipients were chosen by the sisters of Tau Beta Sigma for their excellence and dedication to creating a better band in various ways. The Director’s Award, selected by Director Dr. Polly Middleton and Assistant Director Chad Reep, was given to Eric Chang for leaving a tremendous impact on the band as a whole as well as the individual members he interacted with. The Wenger Family Scholarship, a $10,000 scholarship generously awarded by the Wenger Family to outstanding engineering students in the MVs went to Zachary Biggers, Lena Campbell, and Ashlyn McDonald. The James Sochinski “Spirit of Tech” award is the oldest MV scholarship tradition, and it was presented by Dave Whiteside, the president of the Marching Virginians Alumni Association. The scholarship was given to Lauren Beard based on her outstanding and inspiring application. The night came to a close with a blooper reel of the season put together by Alana Hasset, Online Content Officer and closing remarks by Mackenzie Knox, Executive Officer. The blooper reel featured many funny photos from the season, some of our most embarrassing moments, and a clip of our first ever run of a show - yikes! It was a wonderful way to bring the night to a close and give us a chance to laugh about the funniest memories of the season. The night officially ended with Mackenzie’s closing remarks. As our Executive Officer, Mackenzie understands better than most how special this organization is, and she brought that feeling to life with the final words of The Marching Virginians 2018-2019 season.